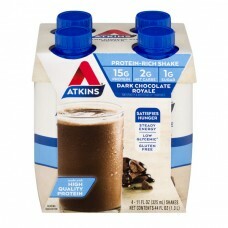 Atkins® Shake Dark Chocolate Royale. Protein-rich shake. 15g protein. 2g net carbs*. 1g sugar. Naturally & artificially flavored. Satisfies hunger. Steady energy. Low glycemic*. Gluten free. Made with high quality protein. 4-11 fl oz (325 ml) shakes. Net contents 44 fl oz (1.3L). What is the "hidden sugar effect?" It's common knowledge that consuming foods that contain large amounts of sugar may cause your blood sugar to spike. But did you know other types of carbohydrates may have the same effect on blood sugar? At Atkins®, we call this the "hidden sugar effect." For example - a medium sized bagel has the same impact on blood sugar as 8 teaspoons of sugar. * An Atkins chocolate shake has the same impact as 1 teaspoon of sugar. * *Based on glycemic load. Amounts do not represent sugar content. *Counting net carbs? Fiber should be subtracted from the total carbs since it minimally impacts blood sugar. Total carbs (6g) - fiber (4g) = 2g Atkins net carbs. Deliciously satisfying: Atkins® shakes give you the perfect combination of protein, carbs and essential nutrients to satisfy your hunger and provide steady energy throughout the day. Enjoy all of our delicious flavors to satisfy your taste buds and keep your net carbs & added sugar in check. Sustainable Forestry Initiative, certified Sourcing. www.sfiprogram.org. FSC®. Mix board. Please recycle. 1-800-6-ATKINS. Find out more about the "hidden sugar effect" at atkins.com. ©2017 Atkins Nutritionals, Inc. Shake well. Best served chilled. Important: must be refrigerated after opening to maintain safety.